Offshore fishing, sometimes called deep sea or open water fishing, is fishing in deep water (more than 90 feet) and at some distance from land. If you are planing to catch a pelagic (marlin, tuna, sailfish, dorado) you can't go shorter than this departing from Puerto Vallarta. In this offshore private fishing charter our professional crew will do the dirty work for you, teach you the bases (if you need guidance) and help you with everything you need. Of course, if you want to get your hands dirty, you are invited... We do not want to hog all the fun! El Morro 8+hrs: The first place where you can find trophies; all the above plus mahi-mahi, sailfish, rooster-fish, and occasionally marlin. La Corbeteña 10-12+hrs: Here you can find marlins, small yellow fin tunas, and all of the above. El Faro 10-12+hrs: Sailfish sea, along with occasionally yellow fin tunas. Is the more random fishing ground of all, can be dry or very successful from one day to another. El Banco 14+hrs: the most reliable place, and also the furthest, home of the 300+ yellow fin, marlins, monster snapper, mahi-mahi, sailfish, hammerheads... you can find everything here. 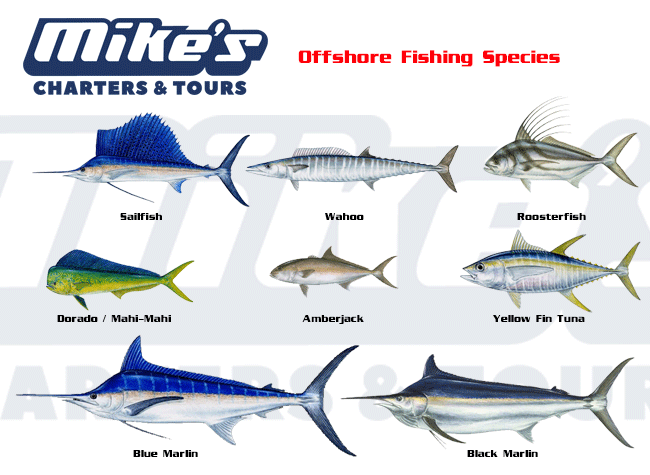 Check this chart with the most usual catches you will find in offshore fishing trips.